UC Davis maintains three research vessels, the R/V John Le Conte, R/V Bob Richards, and R/V Ted Frantz. These boats are moored at the Tahoe City Marina in Tahoe City, California. Researchers at Lake Tahoe have been gathering data on the lake beginning in 1958 with Dr. Charles R. Goldman and have produced one of the longest continuous data sets available for an alpine lake. This long-term record along with the research and analysis of this data contributes to the knowledge base on alpine lakes. An ongoing monitoring program is essential to water quality protection in the Lake Tahoe region. The goal of monitoring is to characterize water quality and the degree of support for beneficial uses on both temporal and spatial scales. ‘Baseline’ data can be used to set standards for water bodies that currently do not have site-specific standards. ‘Trend’ information defines the need for, and allows prioritization of, restoration and/or regulatory actions. Monitoring can also document compliance with permit conditions, and the success (or failure) of remedial activities. The UC Davis Tahoe Environmental Research Center has been an active member and committed partner in the Lake Tahoe Interagency Monitoring Program or “LTIMP.” The mission of LTIMP is to develop integrated water quality research and monitoring strategies to support regulatory, management, planning and research activities in the Lake Tahoe Basin. Lake Tahoe Profile (LTP) monitoring is conducted every 10 days to determine changes in lake clarity. This includes conducting Secchi disk measurements at the mid-lake and index station (off west shore near Homewood), measurements of primary productivity (see section on primary productivity sampling), light penetration into the water using a photometer, and temperature measurements down to 150 meters. Zooplankton samples are collected using a net pulled from 150 meters depth up to the surface. The zooplankton samples are stored and counted in Davis and include species such as Diaptomus and Epishura. Mid-lake Tahoe Profile (MLTP) monitoring is conducted every 30 days and includes similar measurements as listed above. 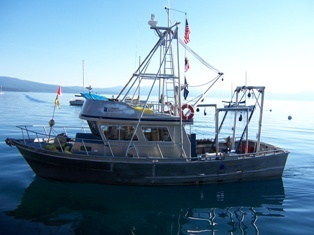 Primary Productivity (PPr) sampling occurs every 10 days to measure the primary production in Lake Tahoe. Samples of water are collected from the surface down to 105 meters using a Van Dorn sampler for varied depth collection. Samples are then split into glass bottles, injected with C14, and then sent back down to the depth in which they were collected. After the samples are allowed to incubate for four hours, measurements can determine how much carbon was “taken up” by the algae. This measures the instantaneous growth rate of algae. Monitoring of Periphyton: Brant Allen and Scott Hackley regularly don their coldwater wetsuits to collect samples of the attached algae that grows along Tahoe’s shoreline. Attached algae, or periphyton, are good indicators of localized nutrients entering the lake. Researchers have been studying the attached algae in the shore zone of Lake Tahoe for the past 25 years. While the steady loss in lake clarity is sometimes difficult to visualize, the proliferation of periphyton is a readily apparent indicator to the public that the lake is changing in a detrimental way. The monitoring has indicated that there is a greater amount of growth in lakeshore areas where the upland is more developed.